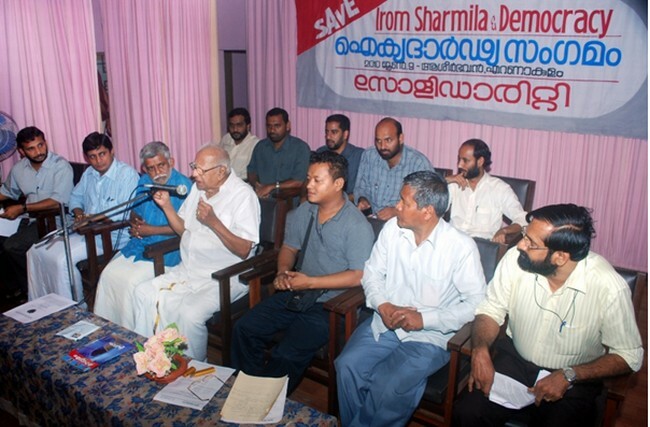 A solidarity conference under the theme "Save Irom Sharmila and Democracy" was held on 9 June 2010 at Cochin in Kerela under the initiatives of Solidarity Youth Movement, Kerala. Executive members of Solidarity Youth Movement. A handwritten letter of Sharmila (annexure II) addressed to the people of Kerala was translated into Malayali and read out to the public who have gathered there. The conference had discussed that democratic values and rights of the citizens are being systematically and consistently subverted by the government in the name of maintaining law and order. The conference had unanimously expressed solidarity to the ongoing fast unto death agitation that had been relentlessly carried out by Miss Irom Sharmila demanding for the repealing of the controversial Armed Forces Special Powers Act 1958. As a follow up of the solidarity conference, the Student Islamic Organisation had convened a public interaction program under the theme "Story of oppression - Unheard Voice from Manipur" on 11 June 2010 at SIO national head quarter in Delhi. The programme was addressed by Irom Singhajit (Just Peace Foundation, Manipur) and Malem Ningthouja (CPDM) and moderated by SIO National Secretary Shahnawaz Ali Raihan. Apart from exchange of views on the issues concerning material implication of AFSPA (enclosed in Annexure I) or its repercussion on the civilians; SIO and individuals who had attended the programme had expressed solidarity to Sharmila and the people of Manipur as well in the struggle for peace and justice. CPDM is thankful to the SYM, SIO and progressive individuals that had not only shown interest but also assured to extend moral and political support on the issues related to the restoration of peace and democracy in Manipur. Note: Minutes of the questions that were being raised in the interaction and responded to by CPDM at the public interaction program entitled "Story of oppression - Unheard Voice from Manipur" on 11 June 2010 at SIO national head quarter in Delhi. SIO: On the cultural dimension of AFSPA. CPDM: (The answer was a supplementary to Irom Singhajit's argument that Manipur has cultural, religious, linguistic, food habit, and racial differences from mainland Indians.) Well, brother Irom's argument may be oversimplification of the empirical realities. And yet the perception of difference and notion of otherness conceptualised in the mind of the Indian political leaders while dealing with the peoples living in the Northeastern region cannot be denied. The architects of the AFSPA pandit Nehru and Patel could fully explain it. For them the Northeastern peoples are virile people with pro-mongoloid prejudice. As late as 1947 many members of the Constituent Assembly were relatively ignorant about the Northeastern people. They had to institute a special committee under the supervision of Bordoloi to submit a report on the Northeastern peoples. The report had reproduced the northeast in the format of paragraphs under subheadings, apparently like an anthropological show piece to be analysed and decided upon. The northeast peoples were being perceived as wild people, barbaric and in a comparatively backward state of social development. The wild space of Northeast had to be invested with capitalist exploitation and to do that they required military force to tame or domesticate what they perceived 'wild' or 'atavistic' Northeastern peoples. Culture, therefore, had been a crucial factor in the relentless use of force and it had directly or indirectly helped in inspiring towards the framing of the AFSPA. SIO: AFSPA is meant to aid civil administration and to suppress rebellion or law & order problem. CPDM: The fundamental question is that the Indian ruling class had perceived India from a national perspective, i.e., a community of population who are or who should be psychologically united and have loyalty to an imagined Indian nationhood. They have enforced & superimposed Indian nationalism. All other forces, inhabiting the projected Indian Territory, who do not subscribe to this ideology are being characterised as threat or enemy. Therefore, the question of law & order problem has been framed within the framework of the perception that India was a nation. This is a political issue and it involves economy and other identity questions. However, the Indian ruling class wanted to deal it from legal paradigm. But the legal approach had failed considerably. In 1958 Naga rebellion was more or less confined in the then Naga Hills and Tuensang areas, now Nagaland State which was formed in 1963. From 1958 to 2010 several rebellion organisations had emerged in the entire Northeastern States. In other words, AFSPA had failed to deal with rebellion / insurgency. Quite contrary to assisting civil administration, the army, paramilitary forces have become virtually powerful and have created more tension and insecurity to civilians. Violation of articles 19 and 21 of the Indian Constitution had become widespread as a result of AFSPA. If AFSPA had been imposed to maintain law & order, i.e., security of the people and a peaceful situation, we experience more disturbance and insecurity under AFSPA. SIO: Repealing of the Act rested with state Government. CPDM: According to the parliamentary debate on Armed Forces Special Powers Act 1958 in 1958 whether to declare any portion of the territory as disturbed or not was rested with the State government. However, one must note that Mr. Achaw and Mr. Suisa the then two parliamentarian representatives from Manipur had boycotted the Act. Their voice was turned down. In 2003/2004 the DAN government of Nagaland had urged upon the Government of India not to further extend disturbed area status for Nagaland. The DAN proposal was turned down by the Government of India. Justice Reddy Review Committee instituted by the Government of India in 2004 had come up with its report in 2005. This had not been publicly announced. By chance the report was available through the media. The report had shown that the Act had not assisted civil administration but created more tension. The report had recommended for repealing of the Act. The Government of India had a different view on it. On the other hand, although apparently there are state, central and concurrent lists, it is difficult to differentiate the State Government and the Central Government, when it comes to policy implementation. The Government of Manipur is always depended on the Government of India and always acted as the puppet of the later. The ruling class irrespective of state origin or central origin are corroborative and they serve common interest in the AFSPA. The struggle centred on AFSPA, therefore, is not between the State Government and the Central Government, but between the victims of AFSPA and the Government who want to continue with AFSPA. SIO: On the perspectives of human rights movement and legal support from the Amnesty international and the United Nations. CPDM: We appreciate the initiatives that are being taken up by the human rights NGOs against AFSPA 1958. International human rights organisations such as the South Asia Human Rights Documentation Centre, Amnesty International and certain UN human rights bodies had shown positive response in internationalising the issue. For instance; SAHRDC's India's security tyranny, AI's India: Official Sanction for Killing in Manipur, and concluding observation of UN Human Rights Committee in 1997 were indeed remarkable and had lots of positive impacts in making awareness about human rights condition in Manipur. We appreciate all these. However, we also had certain reservations on the role of these bodies. The UN and most of the powerful international human rights organisations are funded by the capitalist finance institutions. The UN was a silent spectator when US had invaded Iraq. There are several instances when UN and its allied international organisations had remained comparative silence on issues where the interest of the big & developed capitalist countries had been under question. US had been a major player in the UN and China is an emergent power. As long as the US and Indian comprador bourgeoisie had common capitalist interest and on the other hand China continue to control Indian market, these powerful countries would not help us in raising the AFSPA or human rights issue in the UN. Most of the advanced countries had adopted repressive laws and almost all of them are indulging in human rights violation either in their own countries or somewhere. Against such backdrop the AFSPA issues remained a mere reference point at the international level but no concrete help to repeal it could be expected from the UN or the international human rights organisations. CPDM: Firstly, China cannot raise the issue of AFSPA as long as the questions of human rights violation & suppression concerning Taiwan and Tibet had not been permanently resolved in peaceful manner by the Chinese Government. Secondly, as long as India continue to provide with market base for the ever expanding Chinese capitalism, China would not dare to show open support to any political issue that may hamper Indo-Chinese trade relation. At present Manipur cannot expect much from China. SIO: Why would the Indian state need to keep Manipur within India? What are the material benefits? CPDM: The Constituent Assembly of India debate and proceeding had clearly recorded that the Northeast region was important for strategic and economic reasons. The fertile tea plantation economy of Assam; Uranium and coal reserves in Meghalaya; forest and water resources in Arunachal Pradesh; the natural lower Himalayan belt stretching over the entire Northeastern region which could act as the defensive natural fortified frontier for India; relative backwardness in the mode of production which provided lucrative market for the Indian manufacturers and comprador bourgeoisie and so on are some of the examples that have had interested the Indian ruling class. V.P. Menon, the then right hand of Patel, had mentioned that for administrative and strategic reasons Manipur was taken over by India in 1949. All other accounts as well corroborate to strategic and economic importance of the Northeast regions for India. If we look deeper it is the Indian ruling class for whom strategic and economic importance of Northeast had been the priority concern. In Manipur they have established control over the territory and the population. They are making use of the territory and its resources such as the forest products and water resource. They are in control of the market. They are using Manipur as a launch-pad with military bastions to carry out Indian market expansion into the Southeast Asian countries in the format of the Look East Policy. The capitalist interest is being wrapped up by the cloak of national nostalgia and it has been widely articulated to a large section of the Indian mass. Therefore, Manipur within India or outside India is a mechanical situation largely determined by the capitalist interest of the Indian ruling class. SIO: Will repealing of the AFSPA solve the problem? CPDM: AFSPA is just a tip of the overall process of massive subjugation, oppression and exploitation. We have the experience of Kashmir where there was large scale human rights violations in the pre- AFSPA period. We have the experience of series of killings, fake encounters, looting and extortion by a section of the state police force in the Imphal areas where AFSPA had been withdrawn. Killing by security forces will continue as long as there is capitalist intension to use force to subjugate and exploit people and suppress democratic movements. However, we are very much concern about AFSPA because it was a law enacted by the Indian Parliament to legalise killing by the security forces with impunity. You cannot have democracy and AFSPA together; you can have only one. SIO: Insurgent organisations and AFSPA. CPDM: Insurgents are not waging war against AFSPA, but against the Government. They have guns for defence and offensive, they are trained to wage war and they are in the war. With AFSPA or without AFSPA they would have to engage in the war. I don't think that they are apprehensive about AFSPA. They may, however, use AFPSA as a reference point to condemn the government policy of state terrorism which has had serious repercussion on the physical and psychological security of the civilians. They may attempt to organised victims of AFSPA towards their side. Perhaps, AFSPA exposed the militant character of the Indian state while dealing with the fundamental political and economic questions of Manipur. CPDM: The political economy of AFSPA has revealed to us that the Act serves the interest of the Indian ruling class. AFSPA may come or go but the precondition of state terrorism or the real threat to the security of the people would continue under capitalism which is based on subjugation, suppression and exploitation of the workers and peasants. The solution to such capitalist menace cannot be in the form of piecemeal reform of the terror laws imposed by the State. The solution to the problem lies in the unity of the subjugated, oppressed and exploited cutting across religious and regional boundaries towards a revolutionary overthrow of the reactionary regime and establishment of a people's democracy based on scientific principles. This article was webcasted on June 30, 2010.